Hypo allergenic foam – Great paintball mask if you have allergies! The standard lens in the E-Flex might not have UV or scratch protection but they are high quality dual pane thermal lenses that do a fantastic job against fog. The E-Flex also features one of the very few masks that have a zero distortion lens on them, giving you unbridled optical clarity. Allowing you to change out lenses in just under half a minute, carrying an additional lens gives you a high performance mask that you can use for very serious or professional play. This is also one of the few masks out there that gives you great voice projection and also excellent audio into your ears. Most other masks get one but not both right. The flexible skirt at the bottom is very soft and does a fantastic job of giving you maximum bounces, allowing you to stay in the game longer. You can also remove this flexible skirting and switch it up with other Empire mask skirts that are sold, allowing you to affordably change up your look. The skirt will also fit with other Empire masks that have a collapsible bottom. What you may not like is the rather over zealous nose protection. Somebody at Empire must have had a big nose when they designed this thing as there seems to be unusually heavy cushioning on the bridge of your nose. There is a chance that you might have to trim down the foam to make it not press against your nose. This is something you definitely want to do if you feel your breathing is a bit restricted, thanks to the clamp down from this mask. However, if you have a regular sized nose, the fit should be OK. You just might not appreciate the way the nose protector kinds of rides up a little high in your field of vision. Nothing you can’t get used to though, in just an hour or two. The E-Flex goggles only come with clear lenses. Make sure you pick up smoked or mirrored or thermal lenses if you need them as well. All in all, this is another fantastic product from Empire, a company that has always put out brilliant products. The newly launched skull variant is hot on the market right now. But, it comes at a premium price at almost $150. The other more standard color variants however still sell at the $80 to $90 range. 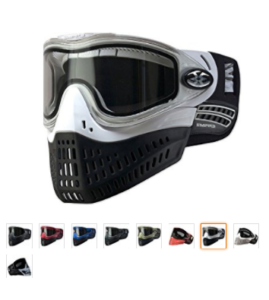 Anyone who has tried a lot of Paintball masks will tell you that the Empire E-Flex is like a baby born to the Empire E-Vent and the JT ProFlex masks, both excellent masks in their own right. 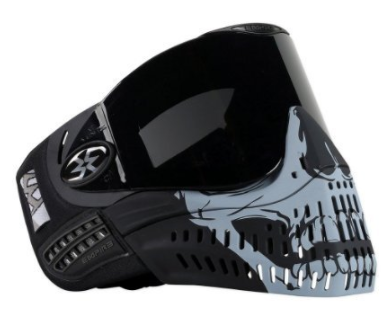 Buy the Empire E-Flex Mask from Amazon Here.